Located right in the city centre, close to the towns of Colmar and Strasbourg, nestles our magnificent charming hotel in Alsace: the Hotel Les Jardins d'Adalric. A true haven of peace, our 3-star hotel in Obernai is the ideal place for all travellers seeking comfort, conviviality and authenticity. Come and live a unique experience in our charming hotel and discover the mythical Alsace wine route. Les Jardins d'Adalric welcomes you for any type of stay: a family holiday, a leisure trip, a weekend with friends or a romantic getaway. Our charming hotel in Alsace offers 46 contemporary rooms. For large families, we offer beautiful family rooms and suites. Take advantage of the calm and comfort of our rooms to offer you real restorative nights. All the rooms of our charming hotel in Alsace are decorated with elegance and tradition. Beyond the comfort of our rooms, our hotel offers you breakfast, a swimming pool, a bar and two seminar rooms. So also offer your employees an exceptional working environment conducive to reflection and concentration. Our charming hotel in Alsace will seduce you with its hospitality, its quality of services but also its privileged geographical location. 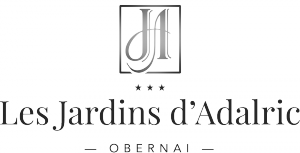 Located halfway between Colmar and Strasbourg, in the heart of Alsace and on the wine route, the hotel Les Jardins d'Adalric is the ideal starting point to discover this French region with many assets. Thanks to its exceptional geographical situation, our charming hotel offers you the opportunity to explore the various cultural and tourist treasures of Alsace. The activities that you can practice during your stay in this charming setting in Alsace are indeed very varied. Discover the local gastronomy; the town of Obernai is full of local restaurants and markets. Don't miss the Robert Blank and Armand Gilg estate for a tasting of the best wines of the region. In Alsace, there are a thousand and one activities. Near our charming hotel in Alsace, you will find something to relax and entertain you. 500 meters from the Adalric Gardens, you will find for example an aquatic complex with spa, saunas, hammams and jacuzzis. A few minutes from our 3 star hotel in Obernai, you will also find many museums and amusement parks. The Wurth Museum, the Unterlinden Museum, Europa Park, Alsace Aventure to name just a few.